STOCKHOLM.- National museum has acquired an elegant necklace by silversmith and artist Vivianna Torun Bülow-Hübe. In the mid-20th century, she transformed the way jewellery was made and appreciated through her design language and her choice of materials. Dating from the beginning of the 1950s, the necklace has a brass neck ring with a pendant in various woods and ivory. 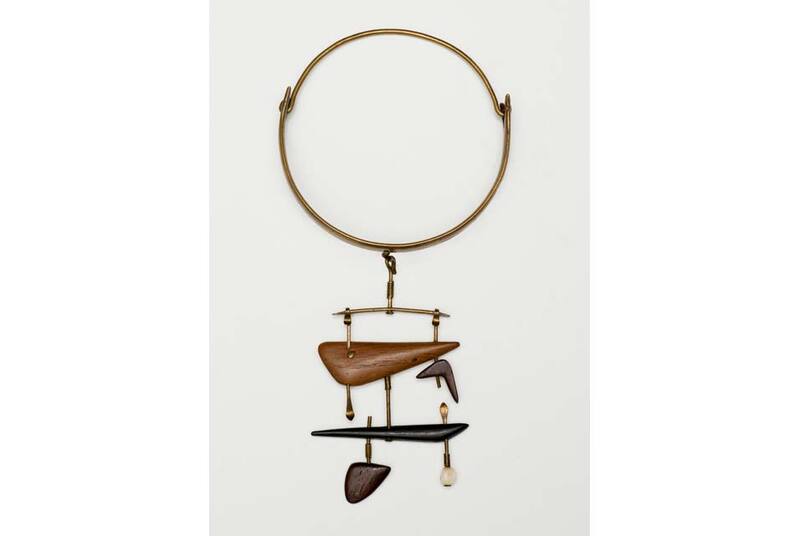 Vivianna Torun Bülow-Hübe (1927-2004) was a pioneer of Swedish jewellery in the mid-20th century, in terms of design, use of materials and attitudes towards the art. To most people, jewellery was a prestigious object that women were given by their husbands and that indicated his wealth and status. The larger the stones in the wife’s jewellery, the more successful her husband was deemed to be. It was this attitude to jewellery that Bülow-Hübe revolutionised when she started to design and make jewellery from more modest materials for her circle of direct female customers, who were enjoying a new found freedom to consume on their own terms following the Second World War. After training at the Technical School (now Konstfack – University College of Arts Crafts and Design) in Stockholm, Bülow-Hübe moved to Paris as a single mother. She made jewellery from relatively basic materials such as rattan and wood and used pebbles from the beach rather than exclusive gemstones. Her designs often involved pure, simple surfaces in soft, organic and asymmetrical shapes. The proportions of the parts harmonised beautifully with each other to stunning effect. Often the pendants on the neck ring could be replaced to meet the wearer’s desire for variety. The particularly elegant necklace that National Museum has acquired is from the very beginning of the 1950s. The brass neck ring carries a pendant made up of irregular wooden shapes and a touch of ivory. The design references the kinetic art of American sculptor Alexander Calder (1898-1976) in his mobiles from the same period. The acquisition was made possible due to generous gifts from the Barbro Osher Foundation and Friends of National museum through the Bengt Julin Fund. The necklace is on display in the museum’s gallery of applied art and modern design.